St. Petersburg, FL - On Wednesday, February 4, the Kursk Root Icon of the Mother of God visited St. Sava Serbian Church in St. Petersburg, FL. 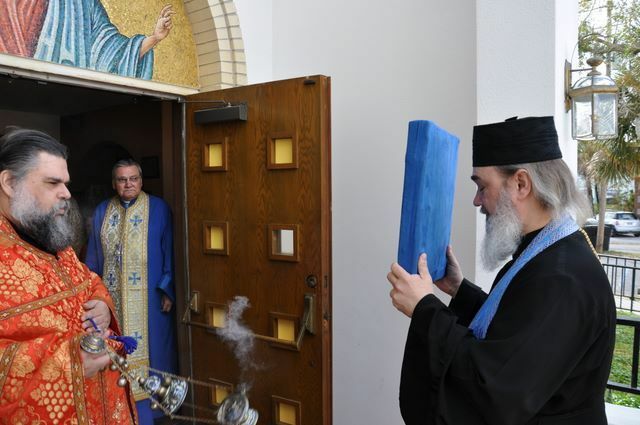 The rector, Archpriest Stefan Zaremba, and parishioners greeted the icon in front of the church to the peal of bells. The moleben with akathist began immediately, led by Archpriest Serge Lukianov (accompanying the icon), co-served by Archpriest Jovan Todorovic (rector of St. George Serbian Church in Clearwater, FL), the rector, Archpriest Miloje Raicevic (cleric of St. George’s Serbian Church), Priest Peter Tutko (cleric of St. Philip the Apostle Mission in Tampa, FL – OCA), and Priest Nicholas Wyborski (rector of St. Nectarios Carpatho-Russian Church in Lakeland, FL). Also praying in church was Deacon Steven Webb (cleric of St. Andrew’s Church in St. Petersburg, FL). Greeting the parish, Fr. Serge underscored the close connection between the fate of the Kursk Icon and the Serbian people, who during troubled times offered a safe haven for Russian refugees, among them the guardians of the wonder-working icon.